Trigeminal neuralgia causes facial pain. Trigeminal neuralgia develops in mid to late life. The condition is the most frequently occurring of all the nerve pain disorders. The pain, which comes and goes, feels like bursts of sharp, stabbing, electric-shocks. This pain can last from a few seconds to a few minutes. The pain comes from one or more branches of the trigeminal nerve-the major carrier of sensory information from the face to the brain. There are 3 branches of the trigeminal nerve: the ophthalmic, maxillary, and mandibular. The pain of trigeminal neuralgia occurs almost exclusively in the maxillary and mandibular divisions. You most commonly feel pain in the maxillary nerve, which runs along your cheekbone, most of your nose, upper lip, and upper teeth. Next most commonly affected is the mandibular nerve, affecting your lower cheek, lower lip, and jaw. In almost all cases , pain will be restricted to one side of your face. Most of the time, doctors cannot identify any disease of the trigeminal nerve or the central nervous system. Trigeminal neuralgia most frequently affects women older than 50 years. The disease occurs rarely in those younger than 30 years. Such cases are usually linked to damage from diseases of central nervous system, for example, multiple sclerosis. The condition has no clear-cut cause. Some experts argue that the syndrome is caused by traumatic damage to the nerve as it passes from the openings in the skull to the muscles and tissue of the face. The damage compresses the nerve, causing the nerve cell to shed the protective and conductive coating (demyelination). Others believe the cause stems from biochemical change in the nerve tissue itself. A more recent notion is that an abnormal blood vessel compresses the nerve as it exits from the brain itself. In all cases, though, an excessive burst of nervous activity from a damaged nerve causes the painful attacks. A defining feature of trigeminal neuralgia is the trigger zone-a small area in the central part of the face, usually on a cheek, nose, or lip, that, when stimulated, triggers a typical burst of pain. A light touch or vibration is the most effective trigger. Because of this, many common daily activities trigger the attacks. Many people avoid food and drink rather than experience the severe pain. These people risk weight loss and dehydration, a leading cause of hospitalization in this group. People frequently require hospitalization for rapid pain control when their trigeminal neuralgia becomes unmanageable at home. Between attacks, most people remain relatively pain-free. A subgroup, however, experience a dull ache between attacks, suggesting physical compression of the affected nerve, either by a blood vessel or some other structure. Trigeminal neuralgia is extremely painful but not life threatening. Thus, a goal of therapy is minimizing dangerous side effects. Homeopathy medicines helps to control recurrent pain in trigeminal nerve. 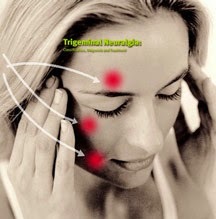 Symptomatic Regular homeopathy treatment helps for trigeminal neuralgia.